Whether you’re starting to train a new puppy or need a replacement leash for your well-behaved dog a leash isn’t just an accessory, it’s necessary. Our four-legged friends need some help during training, and a leash is a great introductory step. However, many well-behaved dogs or well-seasoned family members also need leashes when out for a walk. We’ve gathered all the information to help you find the best leach for your furry friend. Leashes are much more than a simple nylon band that hooks onto a collar. You have to provide a great exercise routine, and most areas require you leash your dog when you have them out in public. But, finding a great leash is difficult. You’re looking for a safe, comfortable, and sturdy leash. Unfortunately, there’s no easy distinguishability between simple and complex leashes. Simple leashes aren’t always better and complex leashes can become difficult to use. But, we’ve brought together everything we could find to help you decide what makes a great leash. There are typically 2 types of leashes, either the standard option or a retractable leash. They both serve different purposes. Standard leashes are everything you imagine when someone says “leash” because it’s very plain. You can find standard leashes in a variety of lengths and thicknesses, but essentially, you’re getting some form of a braided cord. These leashes can span from 4 to 8 feet depending on how much you trust your pup. Some standard leashes are adjustable with a slide, loop, or removable clip. A retractable leash is an available choice. However, there’s some controversy around these leashes. Many dog experts recommend against retractable leashes. Although some trainers recommend using them to familiarize a pup with increased freedom, experts state that a fluctuation of leash length is unfair. With retractable leashes, if your intent to use them to keep your dog close at sometimes and allowing them freedom at other times, you’re sending your four-legged friend mixed signals. But, all controversy aside retractable leashes are still popular. Many retractable leashes extend up to 26 feet which allows your pup a lot more freedom. But greater leash length is less control. There are 3 types of material available, and it’s pretty easy to decide which is best for you. They offer a different range of strength and durability. But, you also have to consider which materials are easiest to handle. The leather is extremely durable, long-lasting, and very comfortable. However, leather leashes are also expensive and can require a bit of maintenance. The leather is also not resistant to chewing which makes it the last choice for dog lovers with puppies. Nylon is perhaps the most popular leash material. It’s usually braided, and although it doesn’t feel as great as leather, it’s not uncomfortable. Nylon is also very budget friendly and weather resistant. Nylon can take a large breed’s tug without issue. Finally, we visit the chain leash. If your dog is an avid chewer, a chain option is probably your best bet. Chains are durable, weather resistant, and hold up to time well. Unfortunately, there are drawbacks to chain leashes as well. They’re typically heavy and uncomfortable to handle. Many people dislike chains because of their visual depiction as well. Leashes come in a number of lengths, and the length you’re comfortable with is a personal preference. But there’s a general guide on choosing which lead length is right for you. Short leads are best for training puppies, and for safety measures. If you know that children easily aggravate your dog, a short leash is best for parks. Even trustworthy dogs can use a short leash from time to time. Consider a 4-foot lead for high traffic areas. Longer leads are great when your dog is curious but trustworthy. Many hound breeds appreciate long leashes as they can explore but you still retain control. Long leashes are also great for distance training. The Mountain Climbing Rope Dog Leash is great for dogs of all sizes. It’s lightweight enough for small breeds but can handle 1,000 pounds of pull. The rope construction makes it super durable, and the construction can handle large breeds like Saint Bernard. 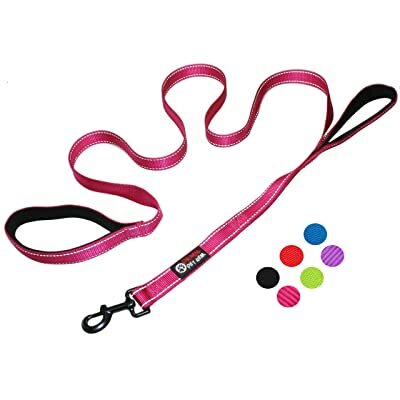 This leash is available in both 4 and 6 feet options and a wide array of colors. The handle is extremely comfortable with extra padding. It also coils easily making it a breeze to transport and store. The cord is a little over half an inch thick which is thicker than most leads. If you have a pup that isn’t chewing anymore this leash is a great option. But the shorter lead makes us realize that this leash isn’t great for all occasions. As the name states, it’s meant for mountain climbing, but it’s great for a variety of situations. 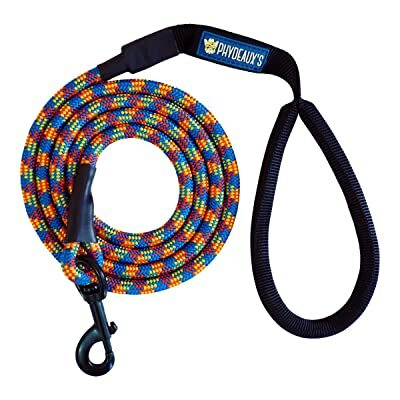 If you’re looking for a leash that can handle a lot of pull but isn’t a pain to handle, this is a great leash. The premier feature is the simplicity of this standard leather leash. It’s 6 feet long and 3/4 of an inch wide. However, it’s important to note that leather’s width doesn’t speak for its thickness. Typically, leather leashes are much thinner because they lie flat. This leash has cowhide leather which is tanned in a 2-step process through both chrome and vegetable tanning. The leather is genuine and offers the amazing feel in your hand. Unfortunately, this leash is only available at a 6-foot length. At the end of the lead is a snap hook that connects to the collar. With double stitching the leash is quite durable, it’s also treated to be water-resistant. 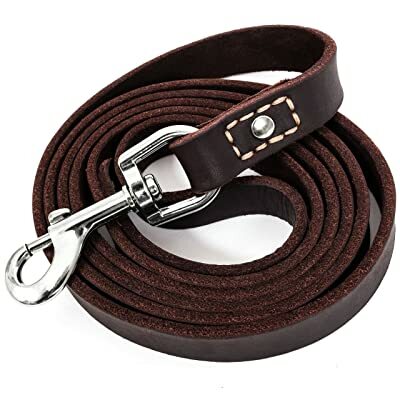 The Leatherberg leather dog training leash is great for a medium length leash, but it comes at a slightly higher price than most other options. This leash is a great option for training your dog to behave when on a leash. However, this leash is a bit of a contradiction here. Because the leash is meant for training puppies, you’d expect it to be both shorter and made of a different material. 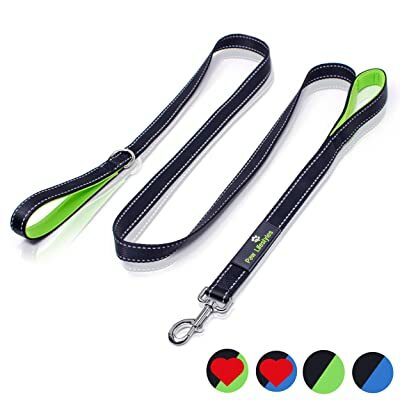 Overall, this is a great medium length, leather leash which works well for most dog owners. Unfortunately, it doesn’t seem to fit it’s intended use of puppy training. This dog leash is made with medium to large sized breeds in mind. If your furry friend needs a bit of guidance from time to time this leash has 2 handles, with the first handle using only a 1-foot lead. The first handle positioned so closely to the clip allows for increased control in high traffic areas. The second handle is at the end of the 6-foot lead which means you can easily let your dog explore while retaining control. The dual handle system makes this leash a prime choice for training. The handles are both padded and incredibly comfortable. The cord is about an inch thick which is much thicker than other options available. The nylon material holds up to pulling well even for large pups. Nothing! There’s not a thing to dislike here, although we could do with a slightly longer length option this is a nearly perfect dog leash. This dog leash comes out with an unexpected bonus feature with the dual padded handles. As a standard leash, you often find yourself missing out on the instant retraction abilities that are useful when you enter a high-traffic area. Overall, it’s a versatile dog leash that has a great price and sturdy hardware. There’s not much more than you could expect from a standard dog leash. It works well with medium and large breeds as it handles a substantial amount of pull pressure. Inspired by the traditional Bungee cord, comes the Bungee dog leash by OutdoorMaster. That’s right, the same cord that people use to jump off bridges and survive can now give your dog the illusion of freedom. The Bungee dog leash by OutdoorMaster appeals to many people who are looking for something other than the traditional training methods. The bungee cord leash is a little over 3 feet but stretches to a full 4 feet with little effort. This leash is about as close as you can come to a retractable with a standard leash. The design caters to larger breeds such as a Golden Retriever and the Mastiff family. Their weight allows the bungee effect to have full-range with little effort. Unfortunately, this isn’t a great option for smaller breeds. Overall this is a great leash for training. The bungee cord takes some of the pulling pressure off your wrist, elbow, and shoulder but doesn’t let them get far. The Bungee dog leash by OutdoorMaster uses a unique design to cater to a niche in the pet world. If you love your pup but know that training is a necessary evil, the Bungee dog leash by OutdoorMaster is worth your time. The short lead helps them learn to stay close to you and is great for heavy trafficked areas. 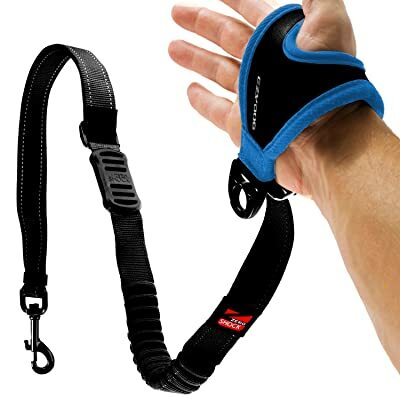 The padded glove-handle is the prime selling point for the EzyDog Handy Dog Lease. Many runners, joggers, and bike riders prefer to use this leash while exercising. There’s a small strip of bungee in the lead, so the shock of an occasional pull never makes its way back to you. The EzyDog Handy Dog Lease is also adjustable, which is a first on this list. Adjustable straps are hard to come by without a drastic reduction in quality. However, this heavy-duty nylon strap easily extends from 3 feet to 4 feet. It’s important to mention also that the glove fits well on either the right or left hand, regardless of size. Many people with arthritis find that this leash works best for them because they don’t have to keep a tightened grip on a thin leash for long periods of time. If you can afford this leash, it’s a great option. The EzyDog Handy Dog Lease isn’t for training, but instead, it’s ideal for small to medium breeds that exercise in high traffic areas. The leash itself is lightweight, and the glove-handle flexes easily. There’s not much more you can ask for from a glove-handled standard leash. The handle easily fits both your right and left hand. It fits most hand sizes but is not ideal for small hands. The clear winner here is the Dog Leash by Primal Pet Gear because of its functionality and price. The Dog Leash by Primal Pet Gear has an outstanding feature for a standard leash. It uses 2 padded handles to offer 2 different lead lengths. This means that you can train openly and minimize the lead whenever you’re near a lot of people. The hardware is also an exception for a nylon leash. You expect great hardware on leather leashes, but nylon leashes are known for being cheap. The lobster clasp on this one doesn’t budge during pulling. Overall, the Dog Leash by Primal Pet Gear is useful, functional and comfortable. Not to mention, it’s available at a great price. The only downside is that it’s only available in the 6-foot option.